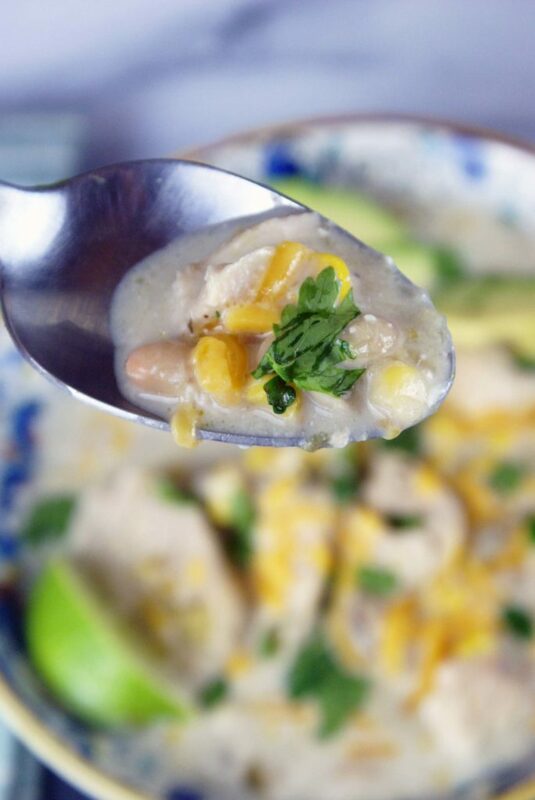 If you are looking for a hearty meal that is sure to warm you up, you should definitely want to try this Slow Cooker White Chicken Chili. This is a family favorite around here! I love letting this cook all day in my slow cooker and when we are done running all of our errands for the day, we get to sit down and enjoy this comfort food dinner. 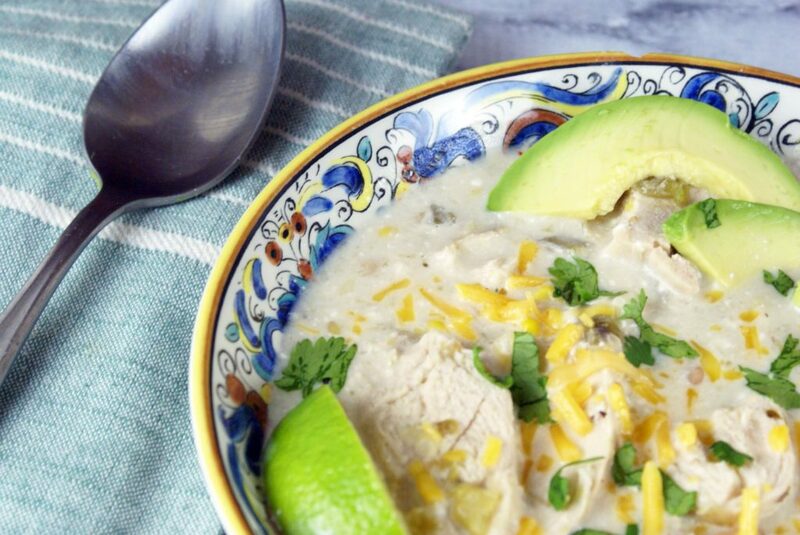 This Slow Cooker White Chicken Chili is incredibly easy to make. Seriously, just add the ingredients as listed below and set your slow cooker then go about your day. You will come home to a delicious and filling home cooked meal and a house that smells amazing. 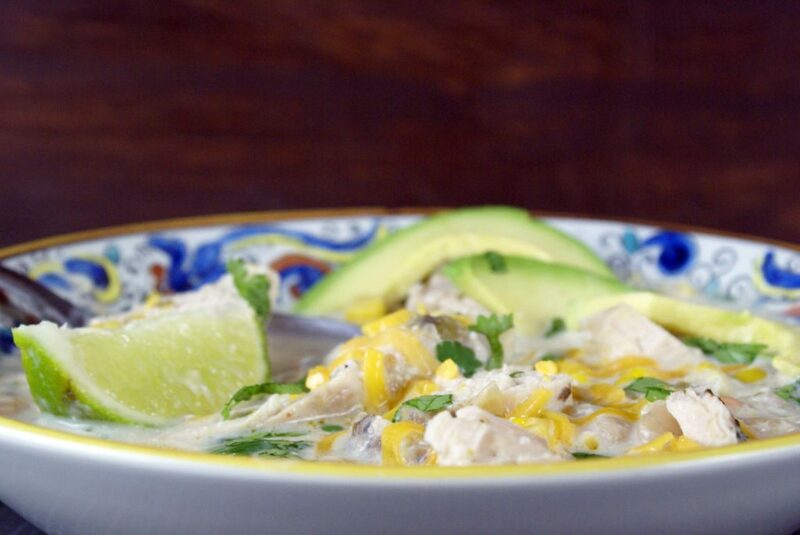 One thing that I love about this Slow Cooker White Chicken Chili is that you can basically add any ingredients you would like to it. Most people that I know tend to like their own personal touches to chili, so feel free to mix it up and add some bonus ingredients. Love the taste of garlic, add some in. If you like spice, by all means, fire it up! 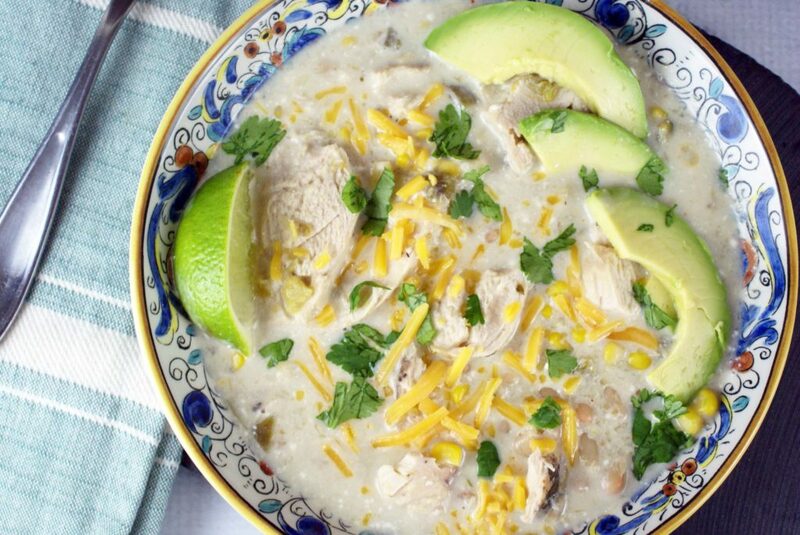 What spices do you put in white chicken chili? With chili, you can change up the seasonings to however you enjoy chili. The basic spices for white chicken chili are cilantro, oregano, chili pepper, salt, and pepper. Slow Cooker White Chicken Chili can be stored in the refrigerator or the freezer. When the white chicken chili is stored in the refrigerator it will last 3-4 days. 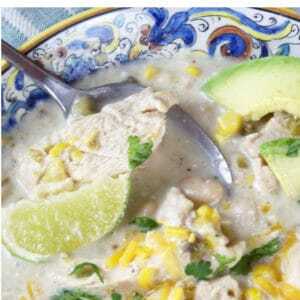 When it is stored in the freezer, the slow cooker white chicken chili will last for 4-6 months. Skip the cilantro if you aren’t a fan. Add another garnish of choice. Want to spice up your chili? Add a few sliced jalapenos to the mixture. 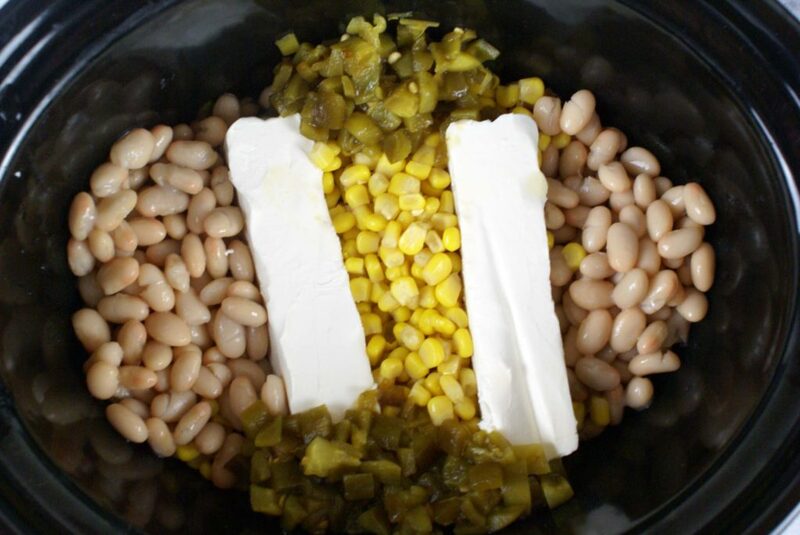 Add beans, corn, green chiles, and cream cheese (cut in half lengthwise) to your slow cooker. Then add chicken broth, layer the salsa verde on top, and finish with your two chicken breasts on the top layer. 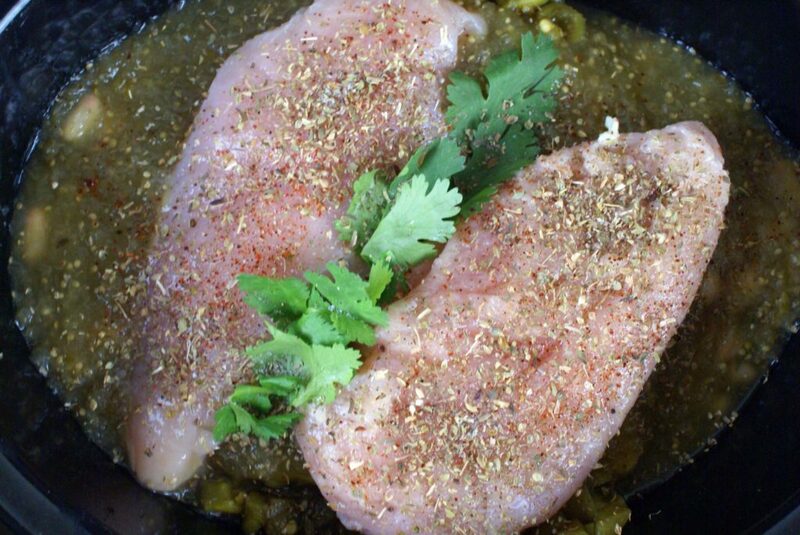 Season chicken breasts with chili powder, sea salt, pepper, and oregano. Once done, remove chicken breasts and shred. After plating, garnish with lime wedge, sliced avocado, diced cilantro, and a sprinkle of cheddar cheese. 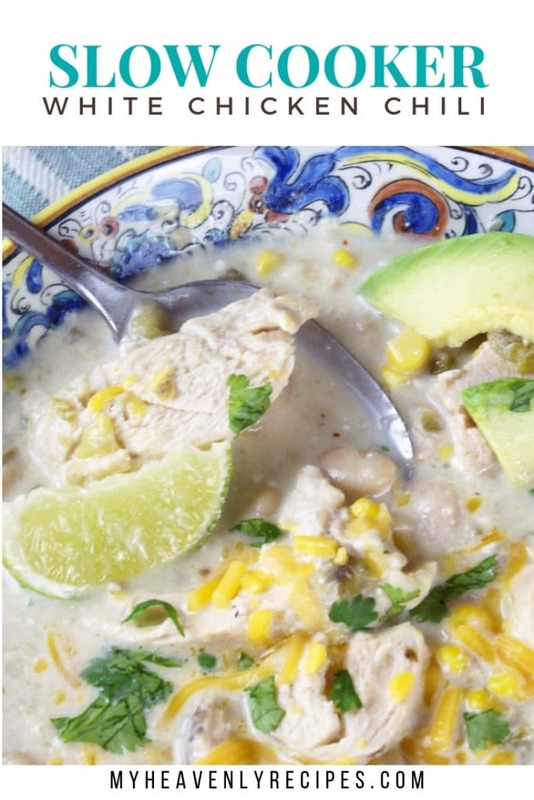 This Easy Slow Cooker White Chicken Chili is a delicious and hearty comfort food.